Preheat the oven to 500 degrees. Use a biscuit cutter to cut the tortillas into sixteen 2½-inch rounds. Combine the sugar and cinnamon in a small bowl. Put the butter on a rimmed baking sheet and put the baking sheet in the oven until the butter is melted, 1 to 2 minutes. Remove the sheet from the oven and spread the tortilla rounds on the sheet, turning to coat both sides in the butter. 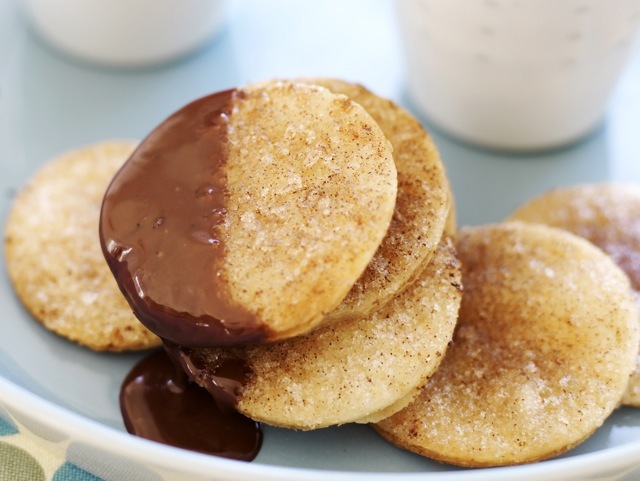 Sprinkle the tops with the cinnamon sugar and return to the oven. Bake until the rounds are golden, 3 to 5 minutes. Transfer to a paper towel–lined baking sheet to cool slightly. Combine the milk and heavy cream in a medium saucepan and bring to a boil over medium-high heat. Reduce the heat to low and whisk in the chocolate until melted. Whisk in the vanilla. Pour into mugs and serve with the warm cinnamon crisps on the side.